Sesshu Toyo (1420-1506) and Sengai Gibon (1750-1837) are two famous individuals in Japanese history. However, despite belonging to the same Rinzai school of Buddhism both individuals had hugely different views of art and the faith they shared. Therefore, for Sengai Gibon he turned to art late in life after neglecting the hidden talents he clearly had because he wanted to focus on spirituality. Alternatively, Sesshu Toyo felt crushed at times by the rigid nature of Rinzai Buddhism during his lifetime. Sengai Gibon also focused his art by turning away from depicting high culture and traditional forms. Instead his art highlighted humor but with a deeper message providing the individual shares the same mind concepts but of course the interpretation is left open for the individual to decide. Also, Sengai Gibon wanted to connect Rinzai Buddhism with all the people of Japan irrespective of status and light natured aspects of his art could reach a wider audience. However, Sesshu Toyo focused on sublime art which based itself on the rich traditions of the time but fused with individualism and new thinking. 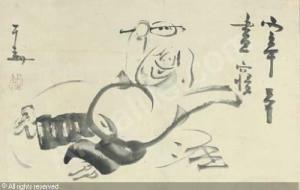 Yet Sesshu Toyo, unlike Sengai Gibon, struggled with his love of art and the religious vocation which he had. Therefore, at times he felt trapped between the religious world and his inner-artistic nature which flowed throughout his veins. Ironically, we will never know the real artistic skills of Sesshu Toyo and Sengai Gibon but for different reasons. After all, Sesshu Toyo had suffered beatings by Rinzai Buddhist priests because of his love of art over religion when he was young. 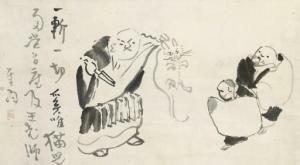 Alternatively, Sengai Gibon had the ability to express more sophisticated art if he had desired but clearly his main emphasis in life was on spreading the Rinzai Buddhist message and connecting the richness of Buddhism with ordinary lay people. At no point does Sesshu Toyo reject Buddhism but the beatings of his earlier life and later constraints meant that he felt artistically unfulfilled. This can be seen by a very intriguing piece of art called “Huike Offering His Arm to Bodhidharma” because many aspects of this painting raises serious issues. The significance of Sesshu Toyo highlighting such an intriguing image in the late period of his life should not be lost. Therefore, I believe that Sesshu Toyo is highlighting his inner-anger towards the hierarchy of Rinzai Buddhist leaders. 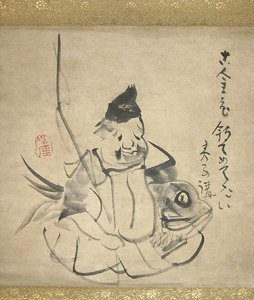 This means that the image of Bodhidharma is depicting Rinzai Zen Buddhism and Huike is the real Sesshu Toyo. 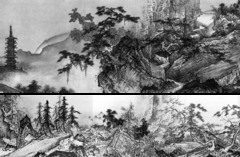 In this sense, Huike is Sesshu Toyo in this piece of art and he is showing his disrespect towards the institutions of Rinzai Buddhist leaders who desire to limit his artistic nature. 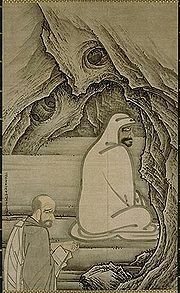 Also, this stunning piece of art shows no feeling towards both individuals and clearly you have little reverence and respect in this art work between Bodhidharma and Huike. This also implies that the artistic passion of Sesshu Toyo was crushed and that Bodhidharma (Rinzai Zen Buddhism) only cared about power and keeping a watchful eye on individuals who desired to express themselves. Likewise, but for very different reasons, the real art ability of Sengai Gibon will never be known but unlike Sesshu Toyo he limited his artistic nature in order to focus on Rinzai Zen Buddhism. Therefore, Sengai Gibon only focuses more on art when he reaches the later stages of his life. Not only this, but Sengai Gibon wants to enlighten all and sundry towards the Buddhist faith he holds dearly. It must be stated that at no time does Sesshu Toyo reject Buddhism because his qualms are related to institutionalism and clamping down on his artistic nature. Also, the approach of both individuals to art is very different and the sense of humor that Sengai Gibon was blessed with shines through deeply within his artwork. Art for Sesshu Toyo took pride of place in his heart but for Sengai Gibon art was a tool to express humility, humor, Buddhism, and thought provoking questions. The reason I　state “humility” is because Sengai Gibon had huge potential but in time “all potential turns to dust” and only “a shell” remains of people who are remembered in history. Therefore, reality is clouded based on different perspectives and how individuals view the world. Meanwhile, for the 99.99% per cent of other individuals then in time nothing is remembered and all names are forgotten. In a way, the art of Sengai Gibon was aimed at the 99.99% of individuals and only elites through reinterpretation have put them on a higher plain based on “images of Zen.” However, “the real Zen,” just like the “real Christianity,” the “real self,” and so forth, is nothing more than an illusion based on multiple factors. For Sesshu Toyo art was deeply impassioned within his heart and religious dogma and tradition ate away at his soul. Yet for Sengai Gibon art was rejected in his earlier life in order to focus on Rinzai Zen Buddhism. Therefore, the art produced by both is not only a million miles away but their real spiritual and artistic vocations meant completely different things to both Sesshu Toyo and Sengai Gibon. Neither rejected Rinzai Zen Buddhism or art but clearly their paths and passions went in different directions. However, in a world based “on interpretation” then what is “real” and what is “false” is up to the individual to decide. Some Japanese art and cultural articles are republished based on the need to inform our growing international readership about the unique cultural reality of Japan.